Email is a smart investment. According to the Direct Marketing Association's recent study, email marketing on average has shown to return $43.62 to the dollar. Direct paper mail only returns $15.22 to the dollar. And let's not forget the cost in savings on printing, paper and postage. Clearly sending bulk email is a smart choice. It's the age of the smart phone and email is more accessible then ever. Now when you send bulk email getting in the inbox means getting in the pocket. If you have a small list a campaign will be completed in a matter of hours. If your list is in the millions it can take a couple days. You don't have to wait until your campaign is completed to see results. You will be able to view the progress in real-time. Targeting your audience with relevant content is crucial when you send bulk email. Tailor your email to an already targeted list. You can also sort a general list by fields and create multiple targeted emails. 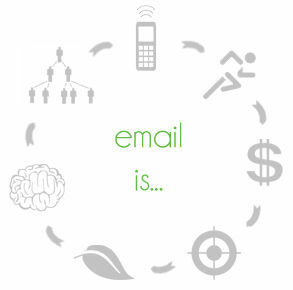 Email can be used for more than just pushing products or services. Send bulk email to promote events like concerts and farmers markets. You could even use email to shed light on a social or political issue that needs attention. Save the planet and save some money at the same time. Advertising via mass email is paperless and extremely environmental friendly. Our planet's rainforests are being devastated at an alarming rate, they need all the help they can get. Not to mention the cost of savings in paper and printing for your business. Email allows you to link your website, pictures and videos of your product. Customers can purchase your product/service quickly and easily. They can also use a social media website to share it with family, friends and co-workers. See for yourself what bulk email marketing can do for your business! Work smarter not harder with auto-responders. Don't worry about sending out thank you messages or greeting the user upon signup. Let HyperMail's auto-responders take care of that for you. With the advancements in social networking technology emails can now be shared across a multitude of social networking sites like Twitter and Facebook. This makes it quick and easy for your email advertisement to potentially go viral. Don't be afraid to try different things. Try out new subject lines, lists, promotions and messages to see what produces the best results.